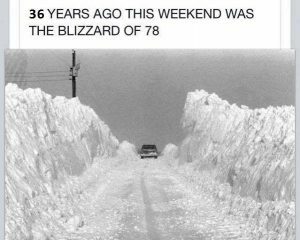 Yesterday it snowed and somebody posted this picture of the Blizzard of ’78 and I was like, “Seems like yesterday cuz I remember the Blizzard of ’78.” Except there wasn’t that much snow yesterday. I was in 6th grade during the Blizzard of ’78. We had a whole week of snow days from January 25-31 during the Blizzard of ’78. You’d think I wouldn’t remember that kinda detailed #postcardfromtheroad #memorylane kinda info 38 years down the road. Especially when you throw in my chemo brain and/or the “Vespa Incident” head injury. But the reason I know all this, is cuz I just dug up my baby book. Which I just now realized my Mom stopped filling out when I was in second grade when my sister was born. Anyway, the reason I dug up my baby book when the white death reminded us all of the Blizzard of ’78 yesterday, is because I was talking to my Mom a few months ago on my birthday (September 27, in case you were wondering) we were trying to remember what time I was born and I have been too damn lazy to have the Hubcap go into the other room and get the box down out of the closet in the #rabbitroom aka my office. Until yesterday’s “snow day” when I remembered the Blizzard of ’78 and that my English teacher gave us a blizzard of homework aka the old “snow pack” trick, which included keeping a journal during the snow daze. I still have my snow daze journal from the Blizzard of ’78. Stuffed in between the mostly unused pages of said baby book. So after he brought me my usual coffee in bed, I asked him to rax me the box so I could finally solve the mystery of the time of my birth. But also, I wanted to see my snow daze journal from the Blizzard of ’78. Jan. 25 – I had to go out and get some logs for the fire place and I was coming back and fell in a hole that had snow up to my waist. I looked up to my mom who was warm inside and she snapped a picture of me. Jan. 26 – I got proposed to today. Yes, my sister and I were coloring and all of the sudden she stopped me and said, “Joules, are you gonna marry me?” I tried to explain to her why I couldn’t but she was too dumb to understand. I watched her all day and was supposed to get five dollars but my mom won’t give it to me yet. Jan. 27 – Another boring day, nothin’ to do because I have to watch my sister. (Now my mom will owe me 10 dollars.) My friends Monica and Lynn cam over to see if I could come out and I couldn’t because of you know who. But tonight will be fun because I’m spending the night with Monica. Jan. 28 – Freedom! I don’t have to watch Jennifer. My mom still hasn’t paid me. My friend Monica came and asked me if I could go and my mom said I could. We went and got Lynn. We went down to the creek and jumped in to see where it was the deepest. Monica jumped in one place that was past her waist. We had to help her out. Jan. 29. – Same as Jan. 28. No, my mom still hasn’t paid me. I might make her pay me a dollar a day that she doesn’t give me the $10. Jan. 30 Guess what? Yes I have to watch Jennifer, hmm $15.00! Well this is going to be boring. Jan. 31. Wow, what a lucky break. I don’t have to watch Jennifer. We’re going to go to my grandma’s. When we got to my grandma’s I went over to my friend’s house. Her name is Julie, and she got some warm clothes on and we went outside. We went to the woods to find a way to cross the creek. It’s water hadn’t frozen. We found a log that stretched across the creek, so I decided to cross it. I was right in the middle and it started to crack. I got off that log and am not goin’ on it again. 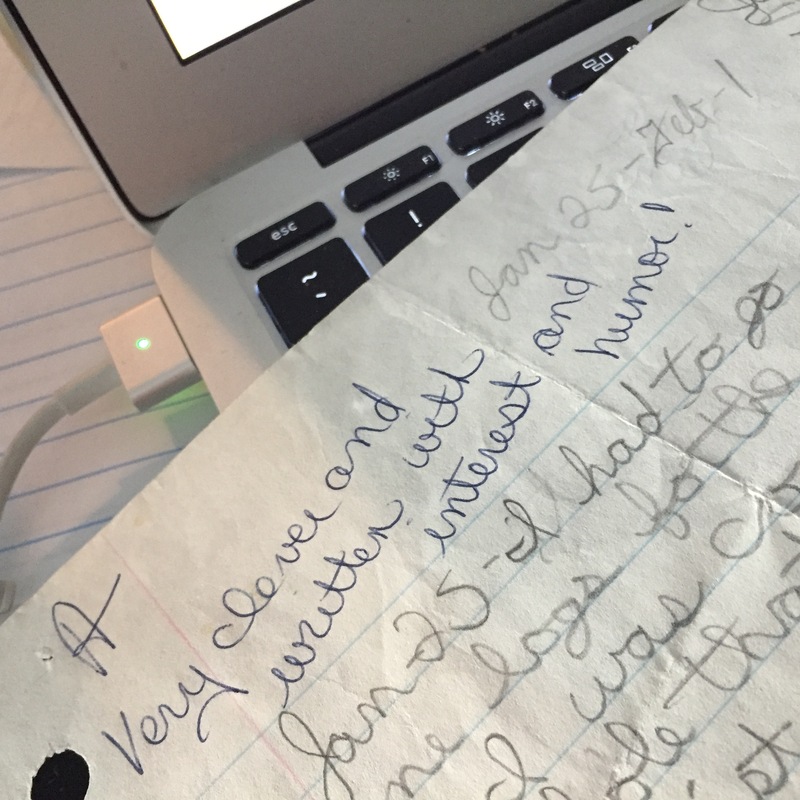 Feb.1 – I think I went to school that day. That WAS boring. All that to say, I don’t thing my Mom ever paid me that $15. Which is whatever. Cuz the main thing about this old journalistic endeavor of mine that STRIKES ME is that it was the first time in my herstory that I wrote something and got egged on. It would not be the last. And so it goes.